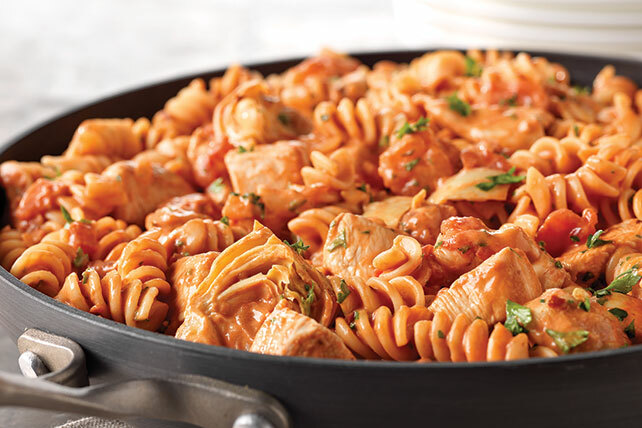 Put together a simple dinner entrée with this quick Rotini & Spicy Chicken in Tomato Sauce! This recipe includes rotini, crushed red pepper & cream cheese. Blend tomato sauce and cream cheese in blender until smooth. Heat dressing in large skillet on medium-high heat. Add chicken and onions; cook 8 min. or until chicken is evenly browned, stirring occasionally. Add tomato sauce mixture and all remaining ingredients except parsley; stir. Simmer on medium heat 5 min. or until chicken is done, stirring occasionally. You will need to cook 2-1/2 cups, or 1/2 lb., rotini pasta to get the 4 cups cooked pasta needed to prepare this recipe. Substitute 1 chopped red pepper for the artichokes.